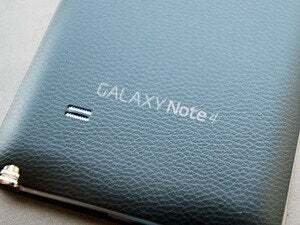 Android phones have a bad habit of beeping during important meetings or buzzing in the middle of the night. Meanwhile, iOS devices and the brand-new, Android Lollipop-powered Nexus and Motorola phones have it lucky. For silent mode, click and hold the volume-down button until the vibrate icon appears, then click the button one more time. 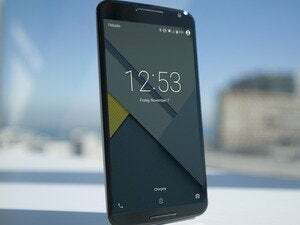 Unfortunately for the vast majority of Android users, myself included, Lollipop has barely begun trickling onto the very latest Nexus and Motorola handsets. Indeed, the latest Android version is available for so few devices that it doesn’t even appear on a recent Android OS adoption chart. Nope, I’m not talking about vibrate mode, which you activate by turning your Android phone’s volume all the way down. Vibrate-only is generally fine for keeping your handset discreet, especially when you’re out and about with your phone in your pocket. But it’s loud enough that my patient wife shot me a look when my Motorola G began buzzing frantically at 10:30 p.m. because, you know, someone posted a selfie on Facebook. You can silence the notifications for individual apps by tweaking your phone’s Apps settings. No, we’re talking about full-on silent mode—a setting I couldn’t find no matter how long I scoured Settings on my Moto phone. Experienced Android users may find this pretty basic, but others (including me, I admit) may have missed it: Just press and hold the volume-down button until the vibrate icon appears, then press it again. 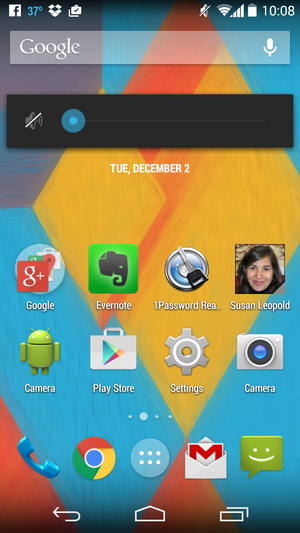 Once you do, the Silent icon will appear in the notification area, and your phone will be effectively shushed. 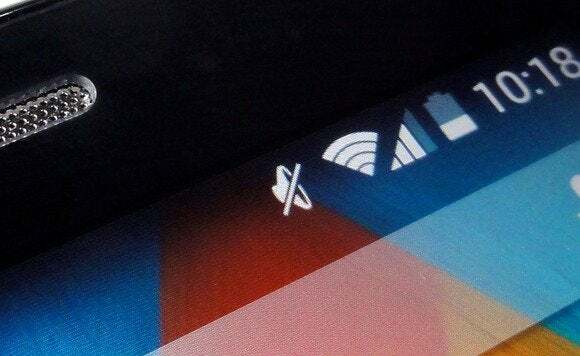 Here’s a downside to silent mode: It’s an all-or-nothing feature, meaning there’s no way to set your phone to turn the ringer back on if, say, your mother is calling. Is that a problem? If so, read on. 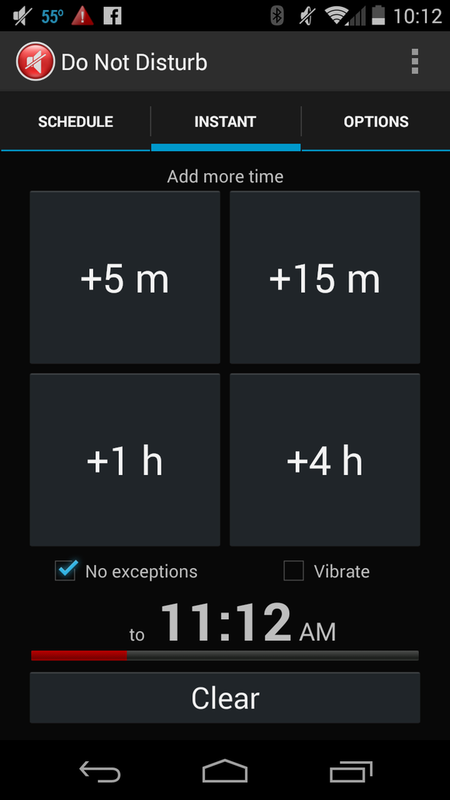 Note: Any alarms you set in the stock Android Clock app may override your phone’s silent mode. 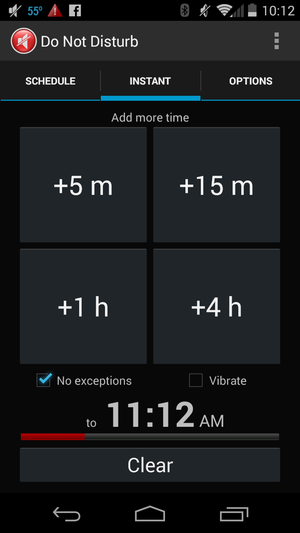 To keep that from happening, edit your individual alarms and make sure the ‘Vibrate’ setting is unchecked. 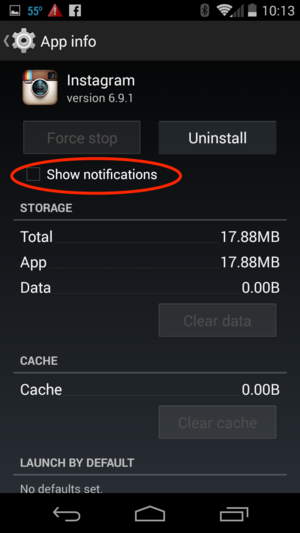 If you’re lucky, the app that’s bothering you will have its own, native notification settings. The Facebook app for Android, for example, lets you toggle notifications for everything from news feed posts to new photo tags. But you can also take matters into your own hands. Third-party apps like Do Not Disturb can silence your phone on demand or on a schedule, and the best ones will also boast a “whitelist” for important callers and texters. Just tap Settings, Apps, tap the Downloaded tab, then tap the app you want to silence. See the “Show notifications” setting? Uncheck it, and you won’t be bothered by the app again. To exercise a bit more control than simply silencing your entire phone or shushing all of an app’s notifications, you’ll need a little help from the Google Play store. A simple search for “do not disturb” on the Play store yields dozens of results. Some of them are games, others are spam filters, and a few do little more than toggle Silent mode on and off. What we’re looking for, though, are apps that silence our phones, but on demand or on a schedule, along with a whitelist for important callers and texters. Among the standouts: the aptly-named Do Not Disturb, which boasts a one-touch instant silence timer for anywhere from five minutes to four hours. In addition to setting a schedule for when your phone goes silent, you can select a list of contacts or Google+ friends who can call and/or text you during quiet hours. You can choose separate lists of VIPs depending on whether it’s daytime and nighttime. Also impressive are options such as ascending ringtone for allowed calls, as well as the ability to disable your phone’s LED alert light. A similar app I liked is Agent, a virtual assistant that syncs with your Google calendars and silences your phone during meetings—perfect for anyone with an ever-changing work schedule. As with the Do Not Disturb app, you can pick which contacts can call or text you when your handset is in silent mode, and you can set the app to send a text to anyone whose call gets blocked. Agent can also silence your handset whenever it senses you’re driving, or shut down your notifications at night after you’ve stopped using your phone for a certain amount of time.